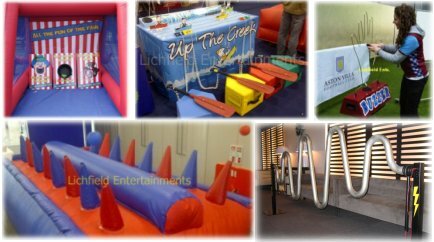 If you're arranging an office fun day or office party then we have some great games and activities that are sure to make your event a success. Even where space is limited, or if access is awkward, we're bound to have something for you. We have small items such as the Giant Buzzwires and these are available in either table size or a huge 8ft long version. We have table games such as Foosball, Air Hockey, Pool, and Bar Skittles. Inflatable versions of popular games like our Giant Velcro Dartboard, Inflatable Skittle Alley, and our fantastic new Air Flow Racer. Then theres the interactive electronic games like the Giant Scalextric, Race Simulators, Light Chaser Reaction Game, 'Up the Creek' Boat Racing, and Saloon Bar Shootout Quickdraw.There are giant versions of Operation, Jenga, Connect 4, Twister, Snakes and Ladders, Noughts and Crosses and more. Side Stall games in traditional stalls, inflatables stalls, or free-standing. Fun rides like the Rodeo Bull, Bucking Sheep, and the Surf and Snowboard Simulator. Crazy Golf from a couple of holes to a full course, and our Inflata-Frame games that are available in a range of games.We even have Photo Booths for some photographic fun. If you'd like some fun food we have Popcorn, Candy Floss, and Pick n Mix stands. If you're holding an office event and you'd like a pricelist or discuss your event requirements further please don't hesitate to contact us and we'll do our very best to help.